Over the weekend, senior figures in the incoming Donald Trump administration began publicly grappling with an issue that is almost certain to create major distractions for the president-elect when he takes office: the myriad potential conflicts of interest presented by his ownership of the business empire that bears his name. During the presidential campaign, Trump said that he would hand over control of his companies to his adult children during his time in office. This falls far short of the steps past presidents have taken to avoid even the appearance of a conflict of interest. The gold standard of conflict avoidance is a “blind trust” in which an officeholder’s assets are liquidated and reinvested by a trustee with no input from the elected official. A coalition of government accountability groups, former White House ethics attorneys, and others wrote an open letter to Trump on Thursday, saying, there is “no acceptable alternative” to his completely severing his ties with the Trump Organization. However, Trump has shown no interest in liquidating his business, and he would probably take a major financial hit if he did. The value of the Trump brand is derived, in large part, from its close association with Trump’s own outsized public persona. Savvy buyers would understand that and adjust the amount they would be willing to pay downward for a Trump-less Trump brand. “I’m very confident that we will operate an administration that is above reproach,” Vice President-elect Mike Pence said in an appearance on Face the Nation. “I can assure the American people that there wouldn’t be any wrongdoing or any sort of undue influence over any decision making,” said incoming White House Chief of Staff Reince Priebus. However, evidence of problematic ties between the Trump business empire and the presidency have already begun to appear. Last week, during a meeting with Japanese Prime Minister Shinzo Abe, Trump’s first as president-elect, he was accompanied by his daughter Ivanka, a move that could easily be translated as giving the Trump companies special access to world leaders. On Tuesday, initially unknown to the media, Trump and his children met with three Indian businessmen who have partnered with the family to build a luxury apartment building in their country. The men posted photos of themselves with Trump and, separately, with two of his children, on social media. On Saturday, the Trump hotel that recently opened its doors in Washington, DC, just a few blocks from the White House, sponsored a reception for diplomats in the city. 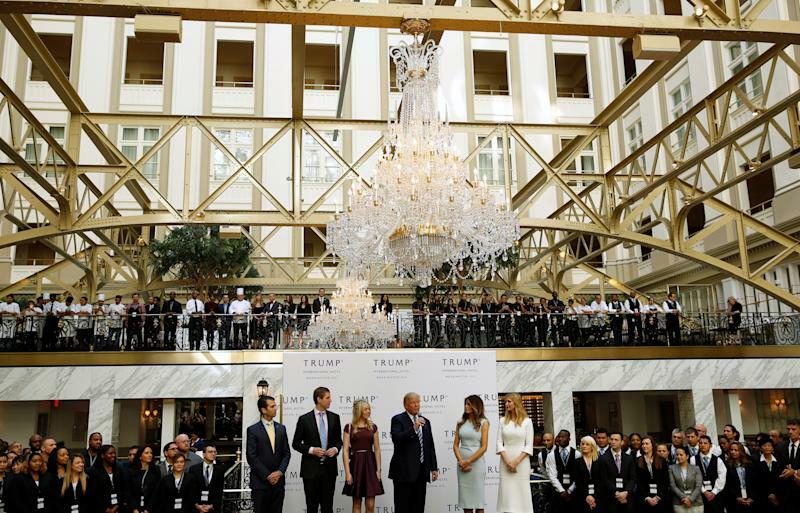 The entire point of the reception was to encourage them to have their delegations and visitors patronize the property owned by the President-elect. In a story about the reception published by the Washington Post, attendees said that they feared it would appear “rude” to the president if diplomats from their countries visited Washington and stayed in hotels owned by business rivals of the President. Priebus, in an appearance on Meet the Press, oddly denied that the events reported by the Post were true, despite on-the-record accounts of the event by attendees. In a separate appearance on CNN, he said it was “ridiculous” to be focusing on the issue of conflicts of interest so early in the presidential transition period. However, watchdog groups are not persuaded that there is a viable way to insulate a President Trump from pervasive conflicts of interest.